Men held signs as migrants and refugees blocked a road in the northern Greek border village of Idomeni on Monday. 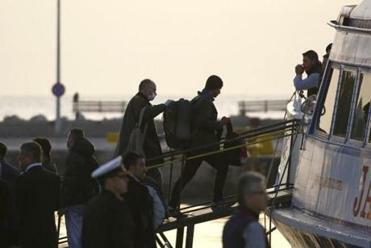 The first boatload of refugees sailed from Greece to Turkey Monday, forcibly expelling refugees and migrants who fled their homelands for sanctuary in Europe. The deportations are part of a controversial deal with the European Union, an agreement that is illegal, impractical, and immoral. The EU should rethink the ill-conceived agreement with Turkey before it sparks more violence. According to the agreement, for every Syrian sent back to Turkey, the EU will resettle one Syrian refugee from Turkey. The EU will pay $6.6 billion to Turkey for its costs. Turks will benefit from visa liberalization for travel to Europe. Turkey’s moribund negotiations on EU membership will be rejoined. The deportations are putting Greece on the verge of chaos. Up to 50,000 refugees vehemently oppose deportation to Turkey. Clashes erupted over the weekend in the Port of Piraeus, and riots also broke out at refugee centers in Chios, Samos, and Lesbos. Two refugees in the Idomeni camp self-immolated in protest. The UN high commissioner for refugees says there are “continued serious gaps” in managing returns. 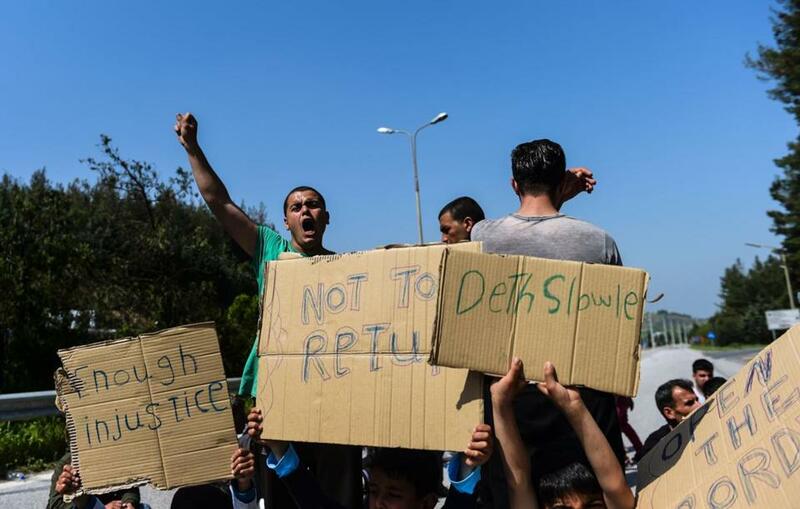 The UNHCR and international nongovernmental organizations suspended work at registration/detention centers in Greece to protest the deal. A controversial European Union plan to curb migration and smash smuggling rings in Turkey began Monday. About 55 percent of refugees are women and children. Many are trying to reunite with male family members who have gone ahead. Returning them to Turkey will rip families apart, causing hardship to the most vulnerable. The “one in, one out” scheme is untested. Many EU member states refuse to accept any refugees whatsoever. Turkey generously assisted refugees during the first years of Syria’s civil war, welcoming at least 2.4 million refugees. However, Turkey today is overwhelmed by the enormity of the refugee crisis. Its policies and rhetoric around relief and resettlement have changed. Amnesty International recently reported that refugees are “not safe” in Turkey. Amnesty says Turkey is expelling refugees back to Syria at gun point, including children, who are forcibly returned without their parents. The Syrian Observatory for Human Rights reports that Turkish border guards have been shooting at refugees trying to enter the country. Last week during a speech at the Brookings Institution, Turkey’s President Recep Tayyip Erdogan asserted that Turkey’s assistance to refugees is “sincere and selfless.” But Erdogan recently threatened to flood Europe with refugees unless the EU provided funds to Turkey. The initial offer of $3.3 billion was not enough. Turkey demanded the EU double its contribution. Given the enormous need, it won’t be long until Turkey seeks even more money from the EU. And what about Lebanon and Jordan, where millions of refugees reside? Visa liberalization is dangerous. Many Turks are ISIS-sympathizers. Turkey has also been issuing passports to Syrian refugees and relocating them to Kurdish-populated areas as part of its plan for social engineering and to boost voter registration for the ruling party. Accelerating Turkey’s EU candidacy is also a bad idea. Turkey has an abysmal human rights record, including restrictions on freedom of expression and killing Kurdish civilians. Until it reforms, Turkey is unfit for EU membership. Just as the EU should rethink its deal with Turkey, the UN should reconsider holding its World Humanitarian Summit next month in Istanbul. What message is being sent to refugees who are in limbo at facilities in Turkey and Greece? Does Turkey deserve to be rewarded by hosting the summit? The forcible return to Turkey violates international humanitarian law and standards of decency. The refugee crisis needs a real resettlement plan, not a fig leaf for Europe’s inaction. David Phillips is director of the Program on Peace-building and Rights at Columbia University’s Institute for the Study of Human Rights. He served as a senior adviser and foreign affairs expert at the State Department during the administrations of President Clinton, Bush, and Obama.